I love cooking, as you know, and I often spend weekends in the kitchen, but this weekend, after a cold snap and then some cold windy days, I was too thrilled with some sunshine and (slightly) warmer weather to be cooped up inside. 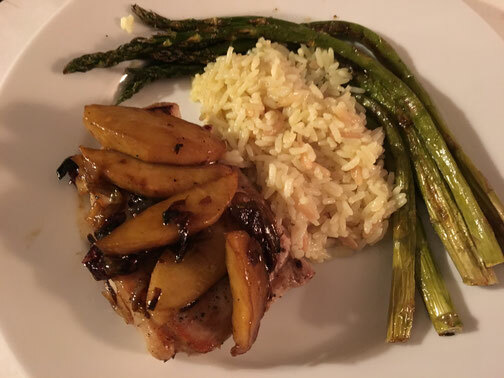 Instead of elaborate dishes, I threw together a quick dinner of boneless pork chops with apples and onions with rice pilaf and asparagus on the side! Preheat the oven to 425 and place the rack in the middle position. Heat a large oven-proof skillet over medium-high heat. Add some butter and oil (I use a mix of both--butter for flavor, oil to keep the smoke point down--but you can use one or the other if you like), add onions and apple, sprinkle with salt, sauté until softened and beginning to brown. Meanwhile, pat the pork chops dry. Season generously with salt and pepper. Move the apples and onions to the outside of the skillet. Place the pork chops in the center of the skillet. Brown for two minutes. Flip. Brown for two more minutes. Flip again. Pile the apples and onions on top of the pork chops and transfer the skillet to the oven. Cook for 6 to 10 minutes depending on the thickness of your chops. Internal temp should reach at least 140 (it will rise a few more degrees while resting to end up at around 145 for medium). Move apples and onions off the pork, transfer chops to a plate, tent loosely, let rest for 5 minutes. Place apple and onion mix in a serving bowl, add craisins, scrape up any pan juices and toss with apple and onion mixture. I serve this with roasted asparagus and rice pilaf. The rice can cook and the asparagus can roast while the pork is being prepped, and using the oven for two things makes heating up the oven for less than 10 minutes of cooking pork seem more worthwhile! *This recipe can be scaled up or down with as few as one or two pork chops up to as many can fit in your pan. Scale other ingredients as needed.